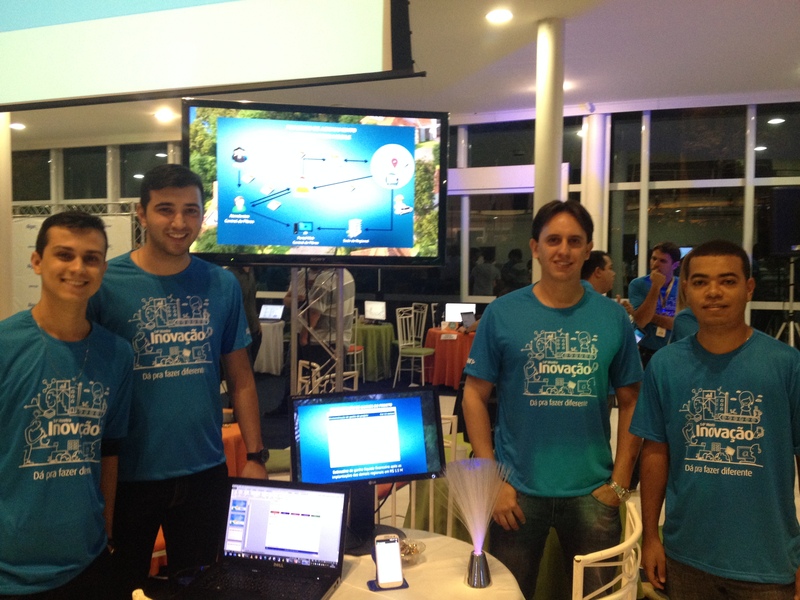 Yesterday I was in the city of Uberlândia, in the state of Minas Gerais, and home to Grupo Algar, an entrepeneurial group of businesses founded in 1929, and which now has 25,000 employees working across telecoms, technology, agriculture, media, tourism, security, aviation and education. In 1998 Algar founded UniAlgar, a corporate university with the mission of developing talent inside the company, and has courses which develop people both personally as well as professionally. Algar also founded the Algar Institute in 2002, Algar’s internal centre of organisational learning, which was created with the vision of the development of humanity and sustainability, and has three main activities centred around sustainability, environment and culture. The corporate motto of Algar is “Gente Servindo Gente” which means people serving people. 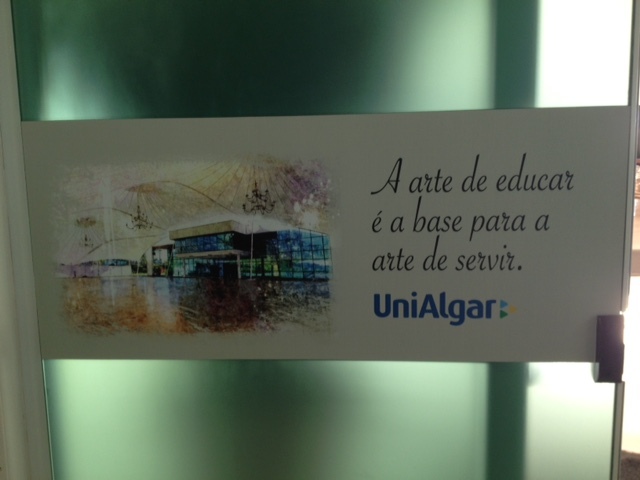 As you can see by this poster in UniAlgar, education is seen as the foundation of the values of service. The poster reads : The art of education is the foundation for the art of service. I wanted to write this article particularly because Brazil is getting a pretty rough ride in the foreign press, and of course much of this is of Brazil’s own making given the staggering revelations coming out of the Petrobras corruption scandal which is now enveloping the Brazilian conglomerate Odebrecht. Brazil is experiencing hugely challenging economic conditions, and a very large number of businesses here are reacting in a knee-jerk fashion and simply dismissing sometimes thousands of employees at a time in a rush to cut costs. This of course damages the economy systemically even further, but can sustainable living companies, ones which are resilient, ride out the storm in a more creative and far-sighted manner? 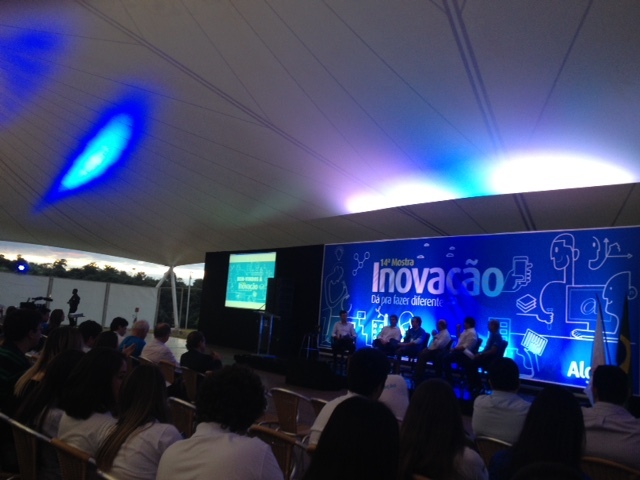 Yesterday I was given the opportunity to attend Algar’s annual InovAção where I heard from a number of their company presidents how Algar is overcoming these challenges through innovation. 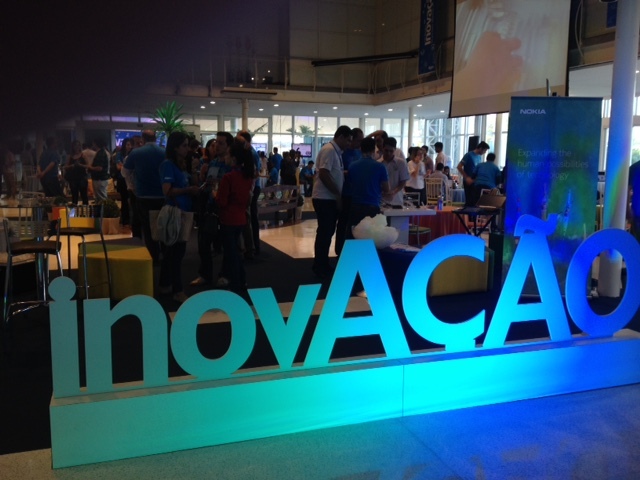 The name of the event InovAção is a play on words in Portuguese, where “ação” also means “action”, hence the A is capitalised to emphasise this. 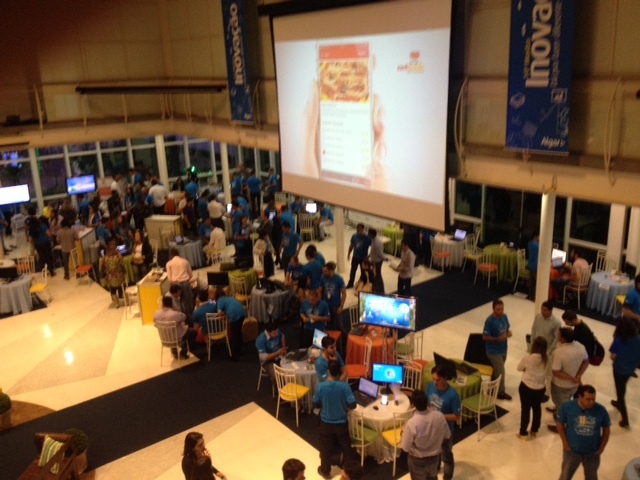 The event brings together around 150 members who are all involved in innovation projects. 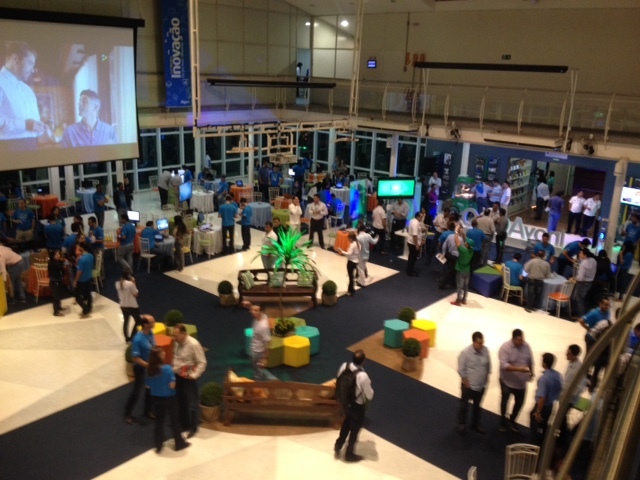 It takes place in the convention centre of UniAlgar, and is an excellent example of how dynamic conversations around innovation projects can be facilitated and fostered across the whole organisation, something which really requires skill, effort and enthusiasm in large groups and conglomerates. What you can see in these photos of the main convention centre hall are many tables each with people presenting their various projects, which are not just about developing new products and services, but which also explore many business processes, production methods, back-end systems developments, sustainable energy, products and packaging, and corporate governance to name just a few. Other guests from both inside Algar and outside are invited to attend, and to speak with all of the project members to learn more about what they are doing and the positive impacts they are already having. I spent some time talking to these guys in this photo below, who had focused much time and energy analysing the logistics system for mobile fibre optic engineers, the guys who fix problems in Algar’s fibre optic network for customers. Brazil is quite (in)famous for bureaucracy, with many organisations showing little appetite to become efficient and improve. However, at Algar this small team focused on analysing the logistics systemically, and developed an integrated mobile application which allowed many inefficiencies to be totally cut out of the process. The investment in this project paid for itself within the first eight months of deployment, and has provided significant cost savings. There will of course be many more positive impacts relating to both delighted customers, and also engineers whose daily frustrations with inefficient systems are now removed, allowing them to do what Algar does best, serving people. Welcoming people to the event was Mauri Seiji Ono, Vice-President of Strategy and Innovation. It was interesting listening to his opening remarks, which while being frank in the assessment of Brazil’s position in global rankings of innovation, very much focused on where the company was heading. Mauri was then joined on stage by a number of Algar company presidents, and it was interesting the extent to which Algar are focusing on changing mindsets not just of the leadership teams but of each and every person within the company. They clearly recognise that company culture is critical, a lesson many other organisations have yet to learn. When I spend time in a company, I really focus on their culture and the quality of personal interactions. Particularly, I look at the senior management team, I look at how they interact with each and every other person in the organisation, and if they really can actually see the other members. This may sound a little strong, but it is quite amazing how those at the top of organisations literally can’t see other members, and when they can’t, well the quality of interactions is poor, people do not feel valued, and the company cannot innovate, since innovation is not a department, it is not a team, it is not a function, it has to be a mindset infused in each and every person. This is what made InvoAçnao so interesting for me to see. There were 56 projects and 14 prototypes on display, and the senior team were able to really use this dynamic to be fully immersed in conversation with people from the whole spectrum of groups in Algar. Each person I spoke to really came across as totally engaged and committed, and the richness of the informal interactions in this type of event are as critical as the more formal meetings that take place in the day to day running of the organisation. 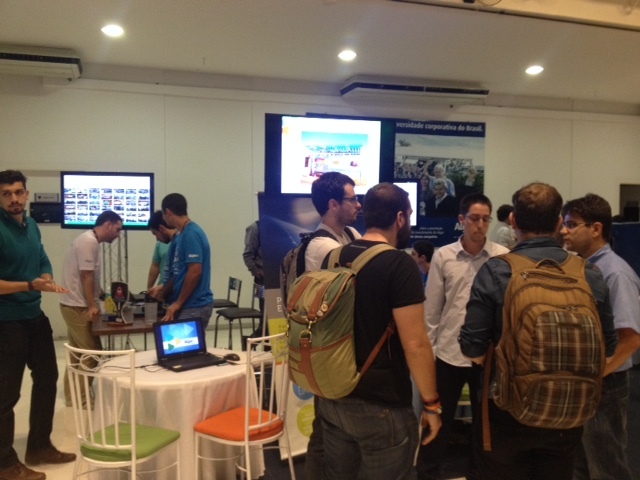 Mauri presented the results of their innovation efforts since the launch of the first InovAção event. In 14 years Algar have identified, supported and funded 905 projects, representing an investment of R$ 77 million and which have delivered R$ 365 million in positive returns. This is the difference between valuing each and every person, supporting their efforts, rather than just laying them off as a short term panicked reaction. José Mauro Floriano is the senior innovation advisor in Algar’s innovation team at Algar Holding, and he has played a major role championing the development of both InovAção and the evolution of innovation as a central value at Algar. In the video above, you will see Floriano (as he is known to friends and colleagues) introduce the event (in Portuguese) from last year to get a better feel for the energy and vibe. Algar are not complacent, they are continually looking to improve and develop themselves. Along with the desire to develop their group mindset, Algar are also absolutely focused on their values. Innovation cannot take place without values – belief and trust in others – especially as one of the presidents mentioned that collaborative innovation is now a new focus for the group. It is this kind of event which happens here in Brazil which the foreign press don’t cover – not so much because they don’t want to – but because these are below-the-radar for them – and so I really felt I wanted to share this particular event on Transition Consciousness. This is how to engage a whole organisation, an organisation which is living, and which is resilient in times of crisis.